People in flood-hit Cumbria are bracing themselves for more heavy rain - with up to 100mm (3.9in) predicted to fall on areas of high ground. 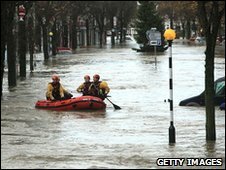 The Environment Agency said the downpour could further raise river levels and bring more flooding. However, river levels are not expected to return to those which brought devastation to areas on Friday. Meanwhile, a temporary railway station is being built to reconnect two halves of Workington split by bridge closures. Matt Crump, of the Environment Agency, speaking after the Met Office issued a severe weather warning for the county, said: "Normally four inches of rain in Cumbria at this time of year would give us some concern. "Obviously after torrential rain at the end of last week the ground is very saturated and the rivers and the lakes are extremely full. "That means we do have some concerns that there will be a certain amount of additional flooding, but it is unlikely that this will be as extensive as last week." He said the agency had prepared for the next band of rain by shoring up flood defences up and removing obstructions from water courses. The agency has 20 flood warnings in place - 10 in Cumbria, six in Wales, three in the Midlands and one in the North East - with a further 75 flood watches across Cumbria. Six bridges have already collapsed in the county as a result of the flooding, causing major transport and logistical problems for thousands of people. Cumbria County Council is warning Workington residents that if the closed Calva Bridge collapses 11,000 homes north of the River Derwent would lose their telephone connection. Residents in the town, which has had no direct road connection since the collapse and closure of several bridges, are being urged to make contingency arrangements and keep mobile telephones charged. The town's river can currently only be crossed by train and a fortnight's worth of passengers boarded services at Workington station, based on the south side, on Monday. Network Rail said it was planning to start work on Tuesday night to build a temporary railway station on the north side of the river. The new station will be built on wasteland just over half a mile from the existing station. The two-platform station, linked by a footbridge, will have lighting, a waiting room and a gravel car park, and will be built and ready for its first passengers by the weekend. Road journeys between the two halves of the town currently involve a more than 30-mile detour. A Cumbria County Council spokesman said the authority was "urgently working" on options to reconnect the north and south of Workington by using a temporary bridge. He said it was likely that a military bridge would not be suitable for local traffic and that the county council's civil engineers were working on possible solutions. A footbridge known as the Old Railway Bridge in the port of Workington is also structurally unstable and the public must not attempt to cross the river by foot here. People have been warned by the county council to exercise caution when hiring tradesmen to help with repairs and to check their credentials. 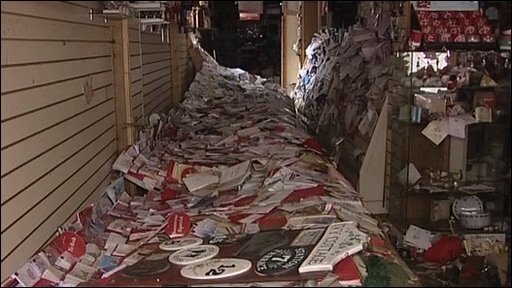 Police allowed householders and business owners to return to the 900 affected properties in Cockermouth as the clear up operation got under way. The premises are being checked for sewage contamination, structural stability and electrical safety. The cost of damage could be as much as £100m. Cumbria Police chief constable Craig Mackey warned that it could take Cumbria years to recover from the damage caused by the floods. Cumbria County Council chief executive Jill Stannard, who took up her post only last Thursday, put the damage in the area at "tens of millions of pounds". Prime Minister Gordon Brown on Monday announced emergency funding to help rebuild bridges and roads devastated by the floods. He said the extra money would be made available to local authorities via the Department for Transport.